Starting Wednesday, February 20, 2019, ODOT will begin the next phase of bridge work along W. Huron Rd., W. Prospect Ave., W. 3rd St. and W. 2nd St. This phase is expected to be completed in October 2019. Laketran will not be able to access W. 3rd St. during this phase of construction. Bus stops 901, 902, and 903 will be out of service. 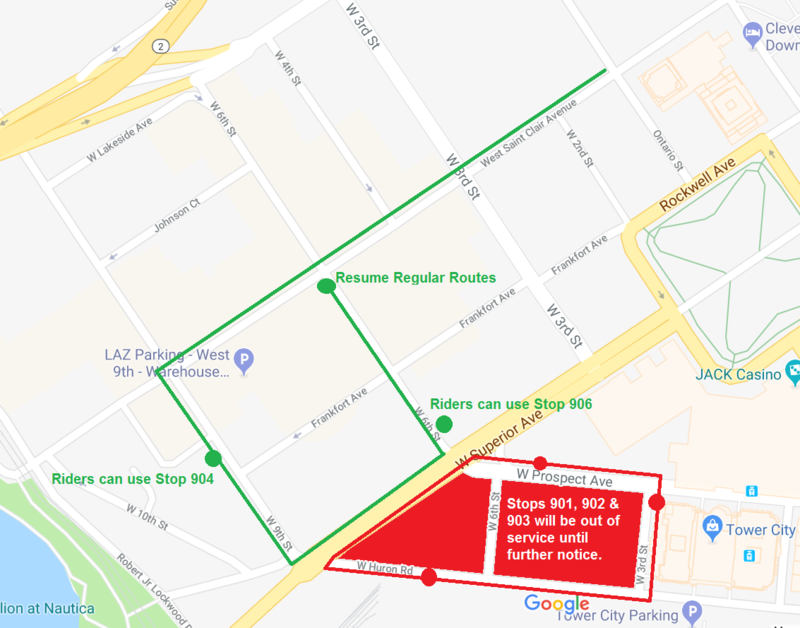 Riders can use bus stops 904 or 906. This detour is in effect until October 2019. Left on W. 9th St.
Left on W. 6th St. Routes 10X, 11X, 12X, and 13 are not affected. Laketran has chosen a strong and dedicated leader to lead the agency in its 45th year of serving Lake County. Brian Falkowski, of Concord, was unanimously re-elected to a fifth, one year term as the Board President of Lake County’s regional transit system. Chuck Zibbel, also of Concord, who has held the role of Vice President since last May, will continue serving his positon. Following the roll call vote, both said they were honored to serve the Laketran Board of Trustees for another year in the two leadership positions and thanked their colleagues for their support. “We have a lot of exciting projects to look forward to in 2019 with the construction of a new transfer center at Lakeland Community College and upgrades to the Wickliffe Park-n-Ride to install charging stations needed to run our electric buses coming in 2020,” shared Zibbel, who is a retired senior engineer from Burgess and Niple, where he managed an expansion of the Wickliffe Park-n-Ride nearly 20 years ago. © 2019 Laketran. All Rights Reserved. Don’t miss out on Laketran news, route changes, rider surveys, and promotions!